Peach season is pretty much over in the midwest. But if you happen to still have your hands on some really nice, ripe peaches, canning them for enjoying in winter is a great treat. They are a bit of work, but well worth it. This is adapted from a groovy canning book I bought the hubby for his birthday last year, "Food In Jars". 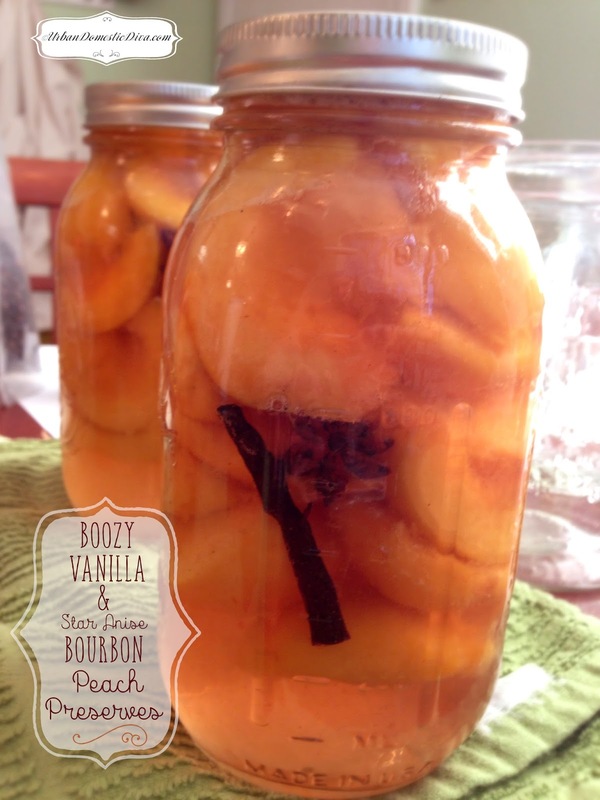 I decided to spice things up by nestling vanilla beans and star anise in with the peaches. We felt that those spice notes would work great with the bourbon used in these lovelies. I have added a video to help you with how-to make these. Canning is intimidating but once you have your sea legs under you the canning possibilities are endless! Adapted from "Food In Jars"
Prepare boiling water bath to sterilize the jars and the lids. Let them sit in the hot water and sterilize for five minutes and invert them on a clean dry towel for water to evaporate and drip-dry. Meanwhile prepare your peaches. Bring a large pot of water to boil. While it's heating up, prep the peaches. Cut them in half and remove the pits and remove any rotting or heavily bruised areas. Fill a large bowl two thirds full with ice-cold water and ice cubes and put it near the hot boiling water. Cut the lemon in half and squeeze the juice into the ice water. The peaches will go in here once blanched and the juice will prevent them from browning. Working in batches add the peach to the boiling water and cook for 60 seconds. Once each batch is done transfer the peaches to the bowl filled with ice cold water. Before adding the next batch of peaches to the pot make sure to give the water a chance to come back up to boil. In between batches you're using this method to get skin off the peaches. Gently peel skin off skin from the peaches in the cold-water bath and continue until all the peaches have been peeled. You may need to add more ice to the cold water bath as you go. Once the skin has been taking off all the peaches cut them into quarters and set aside. Next make sugar water syrup. Combine the sugar with 3 cups of water in a large saucepan. Place over medium heat and stir until the sugar is dissolved. Bring to a gentle simmer. While the syrup heats up pack the peaches, cut side down, into the sterilized jars, nestling them in tightly. Use regular mouth jars instead of wide mouth jars- they will keep the peaches down into the syrup and prevent them from floating up. When all the peaches are in the jars, ladle the hot syrup over them, leaving 1 ½” inches of head space so there's room for your bourbon. Add a generous 1/4 cup of bourbon to each jar (yeah, add an extra splash....or...two). Add 1 vanilla bean and 1 star anise per jar, using a bamboo skewer to tuck the vanilla bean and the star anise deep into the jar. Add additional syrup to the jars until each has ½” inch head space. Wipe the rims down with a slightly damp paper towel to make sure everything is clean. Apply the lids and rings and process in a boiling water bath for 25 minutes. Pull them out when ready using canning tongs. Let them come up to room temperature, undisturbed, while the lids pop. They should be shelf stable for about six months but keep an eye on your seals. If a seal doesn't pop, put the jar in the refrigerator and consume within 2 to 3 weeks. Here is a video hubster and I made to help you along!